Many celebrated 100 years of the moving assembly line. The Ford Motor Company, an American car company, was the first manufacturer to use an assembly line to build its car called the Model T. Instead of the workers moving around to build the cars, the cars were moved. A worker would assemble the same part of each car. 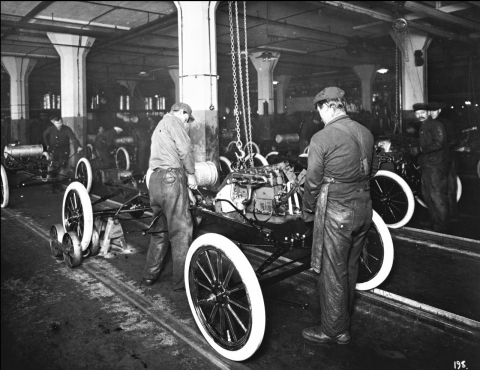 Before the creation of the assembly line, it used to take over 12 hours to build a Model T. The moving assembly line was first started on October 7, 1913 where a rope was used to pull things along. This brought the assembly time of a Model T down to under 3 hours. By 1927, it would take workers on the production line just 93 minutes to assemble a Model T. The Ford Motor company was founded in 1903 by Henry Ford. Here are two videos. One is about the Ford Motor Company. The other is about how Tesla’s Model S car is put together. Tesla Motors is an American company famous for its electric cars.